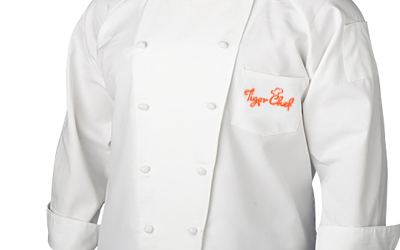 Create personalized chef wear with your restaurant's name and/or logo directly from TigerChef. We customize chef coats, hats, jackets, shirts and aprons with chef’s name, job title, event or even a slogan, as well as your restaurant logo, in any color and style you choose. You can choose the font type to be embroidered in your choice of 21 different thread colors. When ordering your personalized chef wear, please specify this in the Customer Comments box at checkout. Indicate that you would like the embroidered chef wear option. A customer service rep will contact you shortly after placing your order to discuss the various options with you. Alternatively, you can call us directly at (877) 928-4437 to place your order. We use only the finest embroidery thread available whose color will not fade in a hot commercial kitchen environment, even after numerous washings. We can also embroider personalized chef wear with your custom restaurant, company or brand logo by digitizing the logo and embroidering it on. For this service, simply email TigerChef a picture of your logo in one of the following formats: .JPG, .GIF, .TIFF, .PDF or .PNG. at the same time you place your order. Please email your logo to orders@tigerchef.com and be sure to specify your order number while doing so for quick and easy processing. The cost for embroidering a name is $9.00 per item. The cost for name and title is $10.00. There is no minimum order fee and no set up fee for this service. For bulk orders, we offer special pricing, please contact us for more details. For logos, our prices vary based on the complexity of the logo. Please contact us for a price. There is also a minimum order of 12 pieces for this service. Please allow 7-10 business days for processing for all embroidered chef wear. We offer the following thread colors for embroidery: Black, Dark Navy Blue, Royal Blue, Sky Blue, Burgundy, Brown, Gold, Grey, Forest Green, Lime Green, Mauve, Metallic Gold, Metallic Silver, Pink, Light Pink, Purple, Orange, Red, Salmon, Violet, Yellow and White. We offer many font types, so please contact us for a detailed list of available font types.